Have you ever taken a bite of something delicious and just melted into the chair? 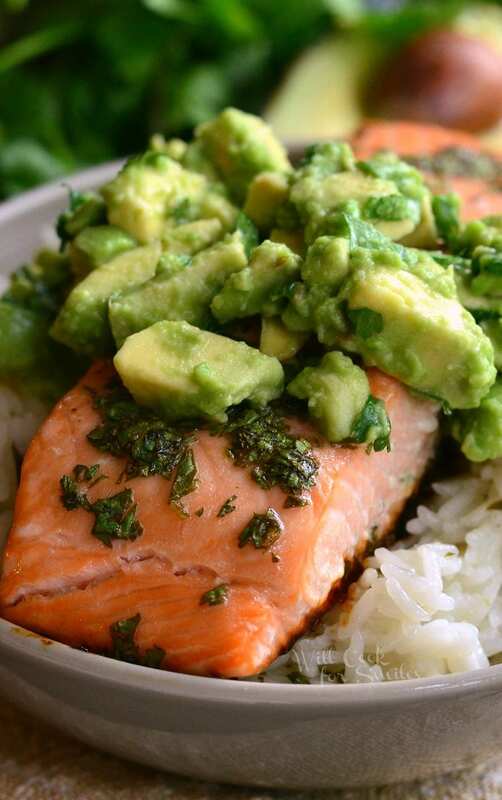 Well, that is exactly how this Avocado Salmon Rice Bowl is going to make you feel! This sweet and citrusy flavor experience is a treat for your taste buds. 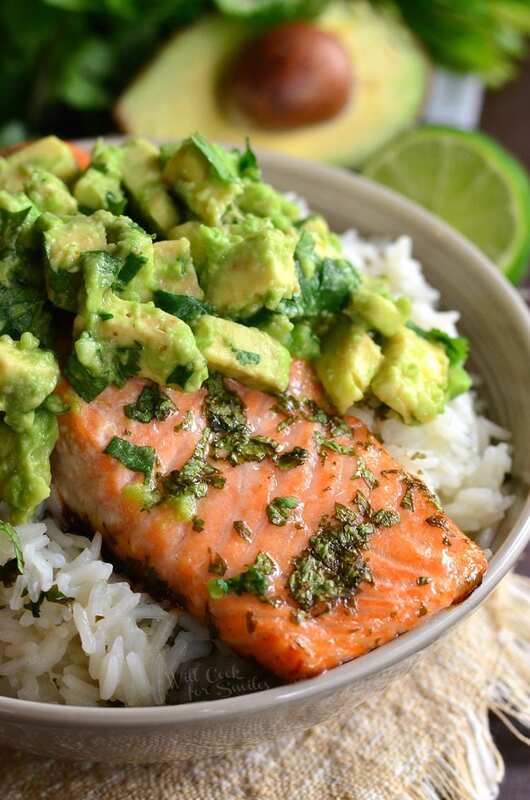 Honey, lime, and cilantro flavors are carried throughout the whole dish and works beautifully with salmon, avocado and rice. I’m such a sucker for seafood, especially when it comes to salmon and shrimp…and scallops, and calamari, and crab. Okay, there is really not much seafood that I don’t like. The only thing I have not tried and loved yet is the raw oysters. I just can’t get passes the texture there, no way. Taking the raw oysters aside, all seafood is wonderful, and especially salmon. That’s my favorite fish and I would eat if every day if I could. Aside from being delicious, the second best thing about salmon is how fast and easy it is to prepare. It takes a couple of minutes to come up with the glaze or a seasoning for the salmon and into the oven it goes. 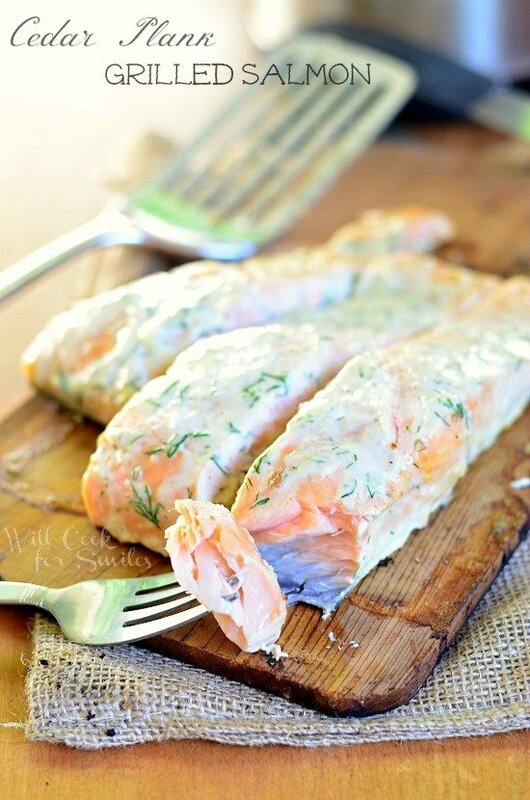 After 12-15 minutes in the oven, you have a juicy, delicious piece of salmon. 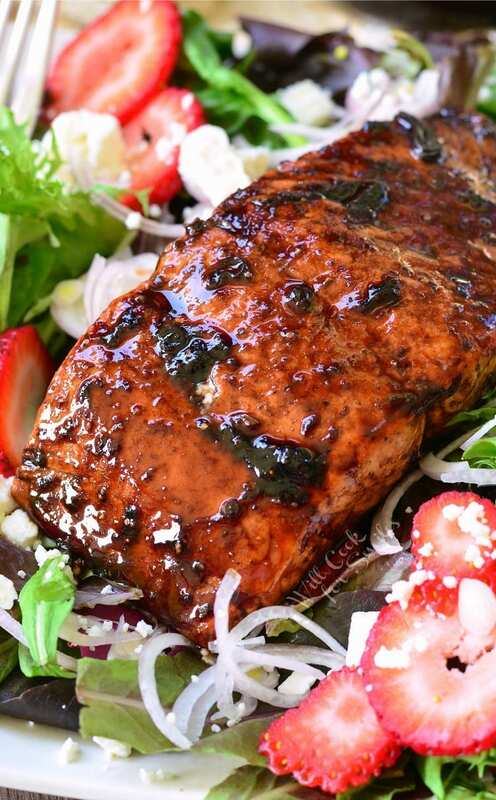 Did you know that salmon is really good for you too? It is an excellent source of omega-3 fatty acids and protein. It’s also a great source of vitamin B12 and vitamin D. Many people actually have a deficiency of Vitamins B12 and D, myself included, so salmon is a great thing to be added to the menu as often as possible. Top if off with some fresh avocado topping and you have a delicious, and really healthy dinner. 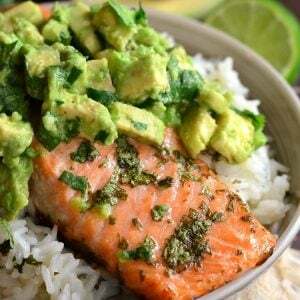 Slightly sweet cilantro lime rice topped with juicy salmon roasted in honey, lime, cilantro glaze and fresh cilantro avocado. Preheat a medium cooking pan over medium-high heat. Mix stock, lime juice, honey, and cilantro together. Pour the mixture into the preheated pan and let it simmer for about a minute. Take the pan off heat and mix rice into the liquid. Season with a little bit more salt, mix well, and set aside. 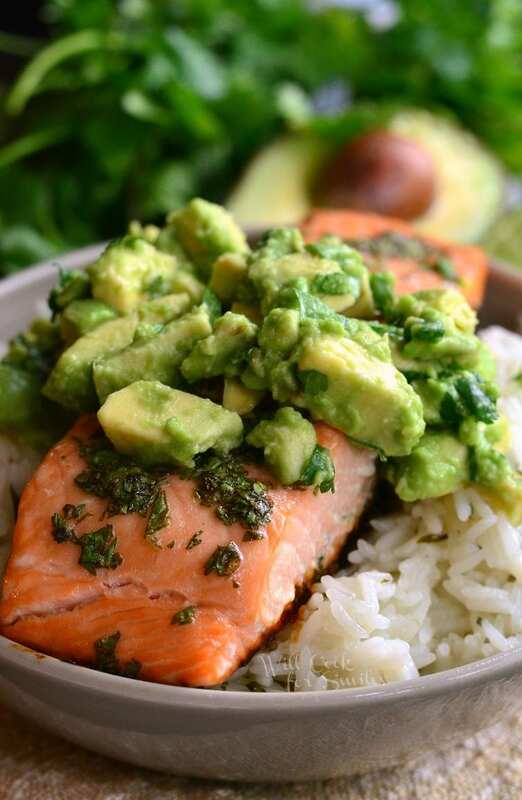 To assemble the rice bowls: divide rice among two bowls, top it off with a salmon fillet, and top each bowl with half the avocado mixture. The Avocado Salmon Rice Bowl was the absolute best recipe I have ever made. My husband loved it as well and kept talking about the depth of flavors for hours after we ate. THANK YOU for sharing! Thank you so much, Sara! I’m very happy to hear about your experience! This looks delicious. Unfortunately I am not a big fan of cilantro. What do you think is the best herb I could use as a substitute? Hi Claudia! Cilantro is really strong, specific flavor kind of herb. If you don’t like it, you can use some parsley. Parsley is very different but not as strong. You can omit it all together or add some parsley for a fresh herb flavor. For avocado, the recipe calls for lime juice. But in the instructions, it says lemon juice. Just wondering which it is. I’m sorry about that, that’s a typo. It’s lime all throughout the recipe. Thanks! I literally just made this. I made it with lemon juice because I only had lemons and it came out perfectly. That’s great to hear, Rita! I’m glad the recipe worked out well for you. I made this tonight. I think it is too much cilantro as it is in every step. I also didn’t care for the sweetness of the honey in the rice. I would make it again skipping the cilantro and honey from the rice. Regardless it was a tasty easy dish. Thanks! 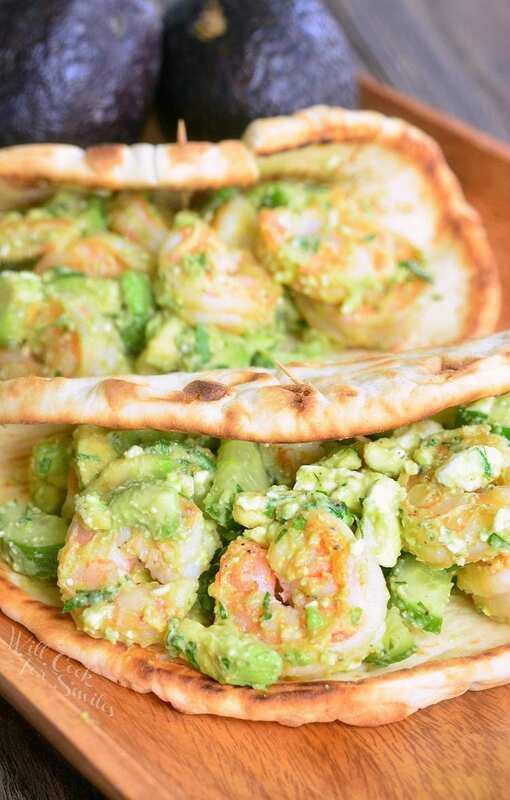 I can’t wait to try this new dish, I love your page.Thank you for sharing! 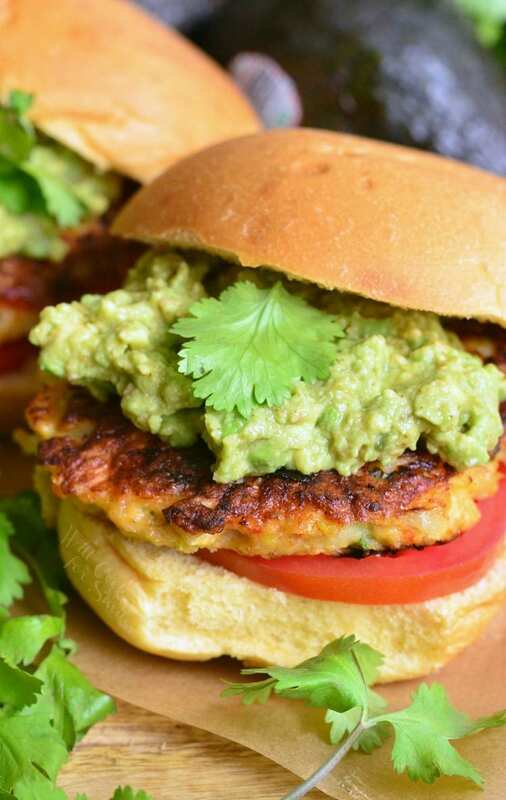 One of my favorite meals – delicious, light, and easy! I personally don’t think there’s such a thing as too much cilantro 🙂 I also love the touch of sweetness in the rice; combined with the chili powder, it’s perfect. This looks delicious. Unfortunately, I have a Type 1 Diabetic in our family. Could you please clarify the serving size? I find the 103 carbs per serving incredibly high. I’m assuming if the white rice was left out, the carb count would be less than 20. If possible… Thank you! The recipe needed some more spice, don’t be afraid to add a fresh chili pepper in place of the chili powder, tastes more fresh and the whole dish “pops” with flavor. Great combinations of flavor! This salmon was delicious! I will bake it in a small glass pan next time instead of a sheet pan. Loved the rice and the avocado topping. Will make again! OMG, this looks delicious! All my fave flavors too. I can NEVER get enough cilantro and avocado. My husband and I love this recipe (he is not even a fish fan)! We are having company and I would like to serve this BUT one person can’t eat cilantro. Any suggestion on what to use instead? So sorry for late response! I can recommend flat-leaf parsley instead but the taste will be a little different. 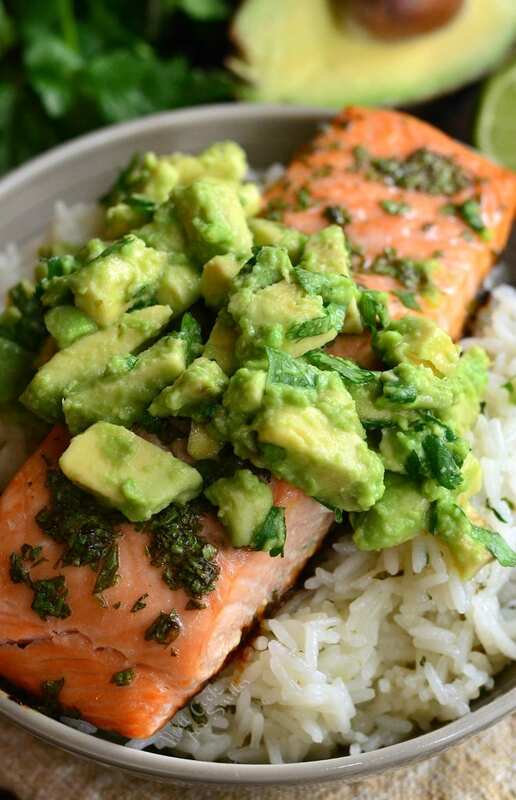 You can try and leave a little bit of rice and avocado separately before adding cilantro and cook his/her salmon separately as well. It may sound like a lot of work but that would be an option too. This sounds amazing, thank you for sharing it! Planning on trying it tomorrow for dinner. Have you tried or recommend adding any kind of soy sauce or sesame oil to it at all or would that mess with the other flavors too much or be overpowering? I really hope you got a chance to try it. Sorry for the late response! I wouldn’t recommend soy or sesame because the pallet is not meant for soy sauce at all and I don’t think it would taste good with cilantro. Sesame oil could also be quite overpowering but depends on how much you add. That was absolutely… disgusting! The skin was soggy on the soggy rice, the cilantro was overpowering… If it was possible, I would demand my money back for my ingredients. FROM YOU. Are you for real? If YOUR cooking did not produce the correct recipe then only one person to blame! I tried the recipe and it was FAB, but then again I cooked it right! Great go to recipe for me now – my 18 month loves it too! Thank you! 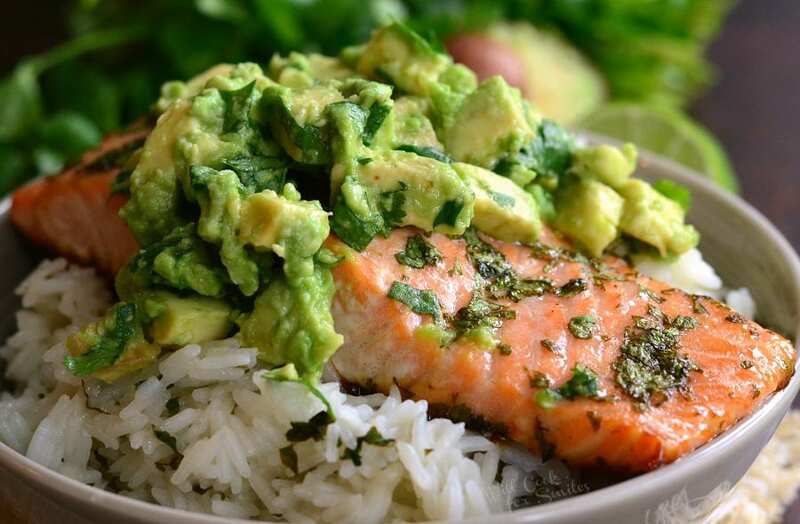 We loved your Avocado Salmon Rice Bowl! I didn’t have lime or cilantro, so used lemon & parsley and it was still yummy. I’m going to try it your way next time! Thanks for the recipe…5 stars in my book! I really love this combination of salmon and avocado! with rice…happy to here to read your blog post… keep update us..